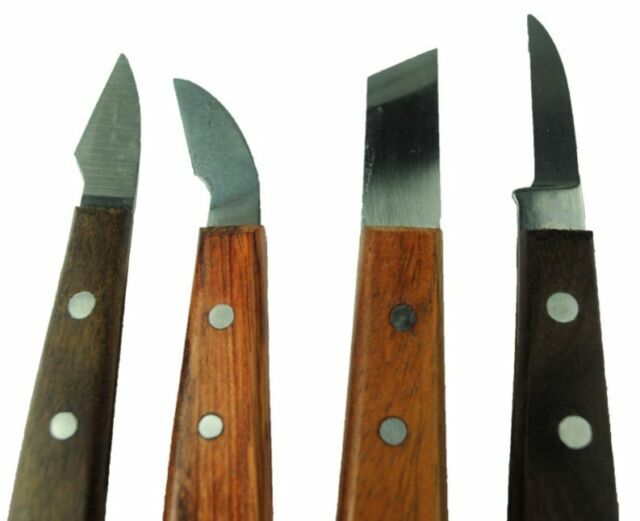 Set x 4 Sheffield made straight, skew, curved and semi curved wood whittling carving tools. To sharpen with an oilstone (we have those listed). Although they seem to be of good quality i was a little disapointed that they were not stamped made in Sheffield which begs the question were they really made in Sheffield and they have to be sharpened before you can use them as they are not very sharp straight out of the box.Having said all that once sharpened they do the job they are intended to do and i like the feel of the handles.Only time will tell if they are of any use after i have done a few carvings as i know a true Sheffield blade will keep it`s sharpness for a while so here`s hoping. Excellent, couldn't have asked for more. Couldn't find anything wrong with these knives. They felt comfortable in the hand when cutting and should last an age. Blades were nice and sharp and ready for use. Good quality steel keeps a keen edge Great value for the money nice to support an English product. Delivered early .